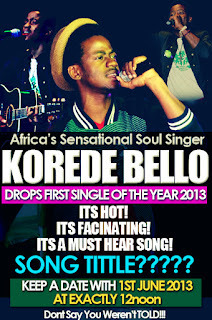 Described as the next rated Nigerian teen pop sensation by Bella Naija, Africa's sensational soul singer, Korede Bello announces the release of his first single of the year 2013 having been working hard in the studio. 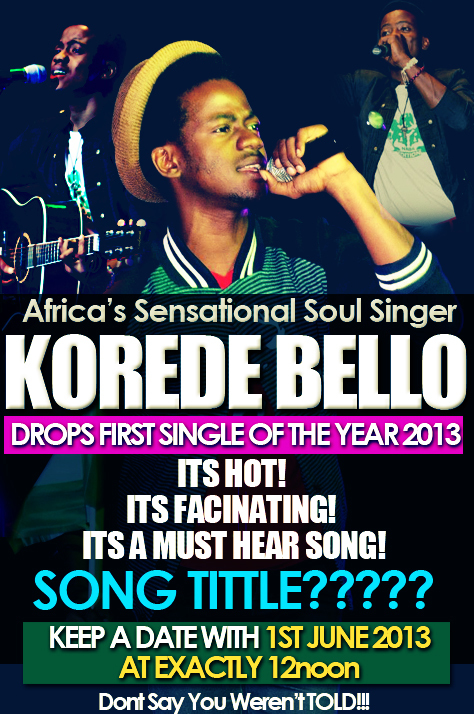 The multiple award winning artiste and 'I Love Naija' crooner is doing something distinct this time. He giving his fans a feel of good party tune, blended with pop so that they can dance away their sorrow. The lyrics has to do with the lifestyle of many Nigerian ladies. More so, he has decided not to announce the title of the song until the first day of June when the song is officially released. He implore his fans to keep touch with him and expect nothing but classic music by exactly 12noon on June, 1, 2013. So Watch Out!